The Titans would open the scoring with a pair of field goals, but the Seahawks would pull ahead briefly on the strength of a WR Doug Baldwin catch from QB Russell Wilson. However, the Titans would put home a third field goal to lead at halftime. Seattle would again take the lead with a HB Chris Carson touchdown catch, but then the Titans would go on to dominate the third quarter, with a HB DeMarco Murray 75-yard touchdown run putting them up 30-14 to end the third. 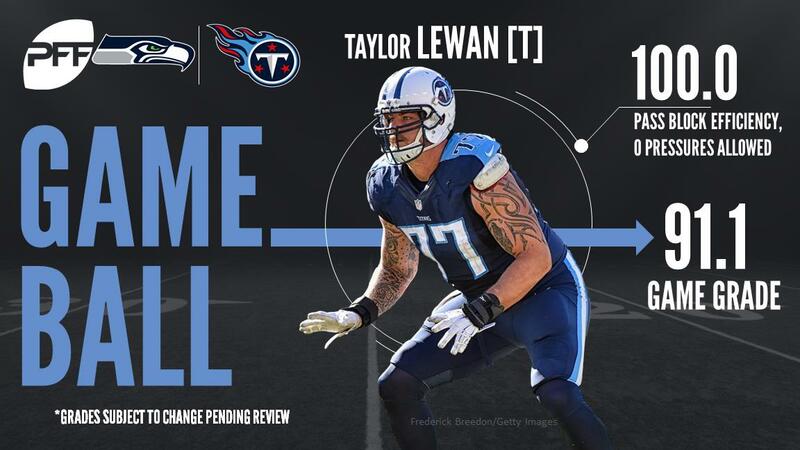 The Seahawks would attempt a comeback, but it would fall short, and the Titans would win 33-27. With that, we give you our PFF exclusive takeaways from the contest for each team. At points in the game, tensions threatened to boil over, and as typical, Lewan was in the middle of the pile when they did, getting in Richard Sherman’s face after a late hit on QB Marcus Mariota. Lewan though was at his best in the run game, and at one point torpedoed himself into a pile to drive it forward for a first down. Mariota missed too many routine passes in this game, struggling to take advantage of an exceptional platform given to him by the Titans offensive line. His touchdowns were the result of coverage busts or run after the catch work by his receivers, but he did make a couple of key plays throughout the game. Woodyard’s six stops were his most since Week 8 of the 2015 season as he made his presence felt both against the Seahawks’ short passing game and their running game alike. With 12 stops through 3 games, Woodyard is already half way to his season total from a year ago and performances like today would hint that he might be getting back to the best form of his career from the 2015 season. Another player to bring the heat to the Seattle offense was second-year safety Byard, who allowed only one completion on four passes into his coverage, including a pass breakup against Jimmy Graham on a slant early in the second quarter. Byard added a hit on Russell Wilson in the third quarter to force another incompletion as the Seahawks attempted to stay in the game. That Wilson continues to produce such stellar performances with no semblance of a platform from his offensive line is truly remarkable. Wilson hit all areas of the field on the Titan’s defense this week en route to a four touchdown display, except backfield left and deep right if we’re being pedantic. Doug Baldwin was his favorite target in the short areas, with all but one of Baldwin’s ten catches coming within 10 yards of the line of scrimmage but Wilson had his moments deeper down the middle of the field too, exploiting a coverage bust for Luke Willson’s touchdown on a seam route. The Seahawks shuffled their offensive line this week with Oday Aboushi coming in at right guard for Mark Glowinski. Little changed in pass protection especially, three linemen including Aboushi surrendered 5 or more pressures and Wilson was pressured on 44 percent of his dropbacks. Straight rushes caused as much difficulty as stunts and playing from behind, the Titans feasted on a still struggling Seattle offensive line. Frank Clark was blanked when it came to pressure by the Titans line, and his game was summed up by pulling up lame as WR Rishard Matthews took a simple bubble screen through the entire Seahawks defense for a score. There wasn’t a huge amount of positivity for the Sehawks defense, who were physically overmatched by the Titans by and large in this game. Chancellor was second on the team in solo tackles (7) and defensive stops (4) and made a couple of impact plays in the run game.